The following photos, taken on Aug 23, 2011, show Lhasa's landmark Potala Palace, six days from the Shoten Festival - one of the most important Tibetan festivals. Potala Palace is in the heart of Lhasa. It was built in the 7th century during the reign of Tibetan King Srongsten Gampo. This more than 1,300-year-old palace is the largest intact group of ancient buildings in Tibet. It is composed of Red and White Palaces. 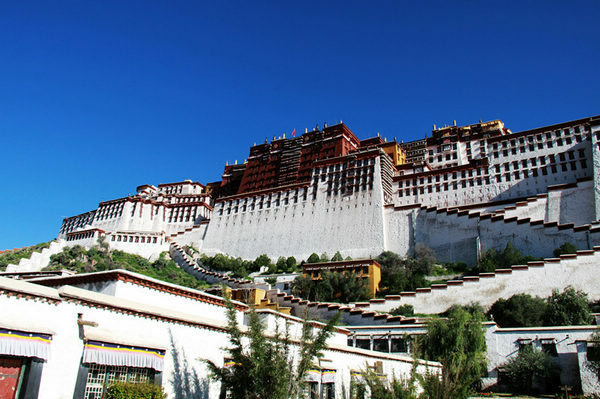 Potala Palace is a rare example of magnificent architecture in the traditional Tibetan style. The White Palace is part of the Potala Palace that makes up the living quarters of the Dalai Lama. The Red Palace, or Potrang Marpo, is completely devoted to religious study and Buddhist prayer. It consists of a complicated layout of many different halls, chapels and libraries on many levels with a complex array of smaller galleries and winding passages. Cameras are forbidden inside the Potala Palace.